Bicycle thieves will need a stomach of steel to thwart the SkunkLock, which makes anyone who attempts to cut through it throw up. San Francisco-based entrepreneur Daniel Idzkowski and engineer Yves Perrenoud designed the U-shaped lock to emit a potent scent when cut by an angle grinder – which is how many bikes are stolen. The smell induces a person within the vicinity to vomit, hindering their ability to flee the area unnoticed. SkunkLock's designers hope their invention will deter thieves from stealing bikes, motorcycles and scooters. Despite 1.5 million bikes reportedly being stolen per year in the USA, thieves are rarely caught and prosecuted. "I've had multiple bikes stolen in my life and have never felt more violated, and frustrated that even the best bike locks available were easily compromised with power tools," said the designer. "We decided that the bike theft problem around the world was serious enough that we had to do something about it." Made from hardened steel that reaches 450 on the Brinell scale, the locks release a custom-engineered compound from the puncture point. Called Formula D_1, it can stain clothes and result in temporary visual impairment, breathing difficulties and vomiting – even through gas masks. The formula is based on fatty acids found in substances like rancid butter and parmesan cheese. Idzkowski and Perrenoud claim that while it smells "extremely unpleasant", it will not cause any permanent harm and is food-grade. They believe it to be legal in the US, although they are still checking legal compliance in other countries they intend to ship to, like the United Kingdom, Netherlands, Germany and France. The pressurised-gas component of SkunkLock named The Shackle can only be used once. If there has been an attempted break into the lock, the user can purchase a new Shackle. "I've been building products and businesses for the last five years in multiple different industries, but I'm particularly excited about SkunkLock," said Idzkowski. 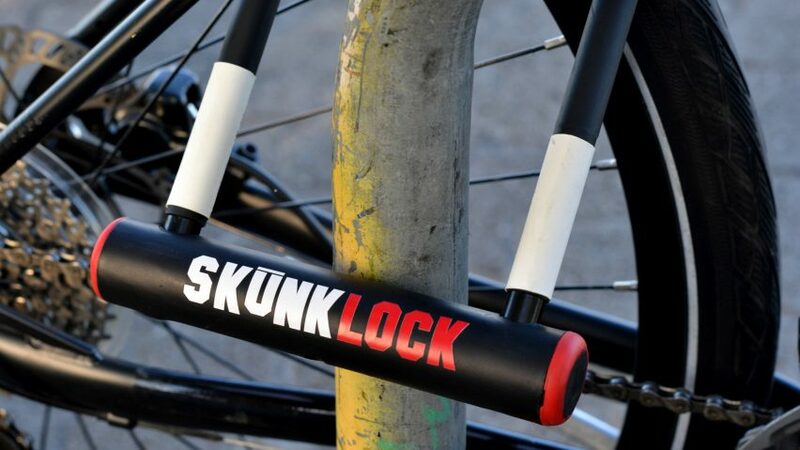 A crowdfunding campaign for SkunkLock has exceeded its target, and the designers hope the product will be available to purchase at $40 (£33) by June 2017. Concerns about bicycle theft have led designers to get creative about protecting cyclists' property. A New York-based company led by designer Oren Livne developed Seatylock, a removable bike seat that doubles up as a lock, while a Canadian company produced a bike lock that only opens when it recognises its owner's thumbprint.